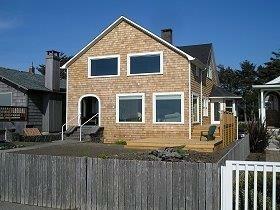 This charming Oceanfront home is located right on the Prom and just a few blocks to the turnaround. Includes a fully equipped kitchen, huge living/dining room with fireplace and sitting area where you can enjoy the panoramic view of the Ocean and Tillamook Head. Master bedroom has its own private bath with an ocean view shower, and a pull-out for extra sleeping. All new bedding, linens, dishes and silverware. also has a lovely deck off the kitchen for your outdoor enjoyment. This is the perfect spot for your next trip to Seaside. (Sleeps 9-10) There will be a $150.00 cleaning fee for this home.